This guy isn’t just a visually-appealing marquee card for the Global Series set, but a legitimate threat for certain kinds of decks. There are some obvious interactions like Serra Ascendant and Ajani’s Pridemate (but note that it only counts as one instance no matter how many creatures you attack with. On the other hand, the Pridemate can trigger it himself!). There are some less obvious interactions, like amassing lots of life to pay for effects like Phyrexian Processor. Dragon is an especially relevant creature type for a lot of large casual formats anyway – did someone mention Kaalia of the Vast . . .
Long, antlered, and majestic, it would not be a Chinese mythos-based set without a long somewhere to be found. 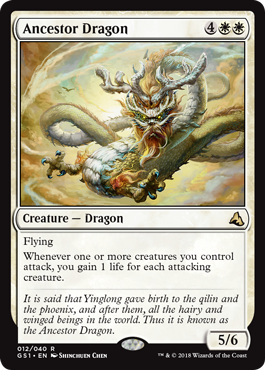 Ancestor Dragon is in white instead of the usual red dragon color, but its effect is very white: gain 1 life for each attacking creature. This includes itself, as a 5/6 with flying is pretty good at attacking, but you don’t need to attack with it to get the benefits of its effect. While life gain is oft an effect that players overrate, incidental life gain like this is underrated. You’re not detracting from your current game plan to get life from this card; in fact, this card encourages attacking to get value, and attacking is how a number of decks win games. (Not all of them, true, but most of them!) In the white “go wide” strategy, this is a formidable boss monster that can put the game out of reach for unlucky opponents, as you can still eke out value after you spend the six mana for this creature.